Lurline's Place: Happy Easter Saturday! I have had a lovely day - still very warm here, but should cool down this week - hope so, and some rain would be nice, too! Heidi and I visited friend, Robin, then into the shopping centre we went! I thought it would be nice for her to choose her Easter gift and there is a new art and craft shop open, so we didn't get past that - a printed canvas and poster paints for a 5-year old - how good does it get! - of course, there were brushes, palettes, and water jars to buy and of course we couldn't go home without gift for twin brother, Byron, so it was double of everything! Then into Kmart so I could buy a few novels and it was more colouring-in books and sticker books! Then we had lunch? - what does a good Nanny do than let Heidi choose what she would like, so it was ice cream for Heidi and poor Nanny, too - yuk! Never mind we had a lovely time and more trivia to read late at night and maybe some baking, too - hope there is inspiration there! The 12 blocks for second-try Dolly Quilt - not as pretty as first try, but it was going that way so I threw in a few browns - is that big brown spot in the middle jumping out at you? You know I appreciate constructive criticism! 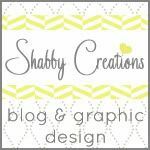 Will get them together and maybe they won't need a border - I have a great pre-made binding in mind! PS - on reflection, please tell me what you think - have I gone overboard again (like with the Angels) and should have left it at 6 blocks only (see previous post) with a 1/2" red framing border, then perhaps a 2" outer border? 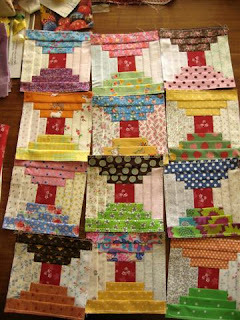 - I think that will be big enough for a dolly quilt? If this is all too boring, please don't feel obliged to give an opinion (lol)! 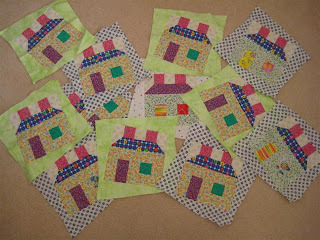 More Happy Houses from Anne, who doesn't have a blog - the final mix-up will be just great, I'm sure - thank you, Anne! 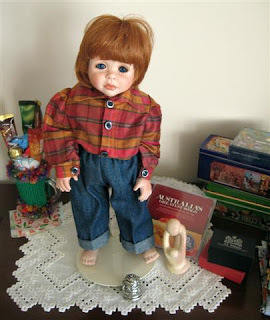 Another porcelain doll - this little Scallywag is a big favourite with both my girls - I guess with a silk shirt and pressed jeans, he has scrubbed up very well! 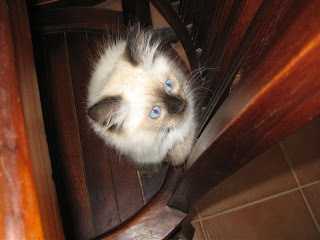 Our real life scallywag, Saskia - I hope everyone realises she is just my grand-kitty and not mine at all - up on the dining room chairs after she has been on top of the patio table - wow, she is advancing rapidly and has a delightful personality - great times ahead for us all! Enough prattle - I wanted to do a lot of handwork tonight, but the tele is sadly lacking, so it is off to bed to read. Looking forward to lunch in the city with the family tomorrow - will be a special Easter Sunday lunch for us! 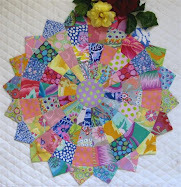 I hope to get together my promised Pinwheel Tutorial for my next post - best wishes everyone! Sounds like a lot of fun. Thanks for the pictures. Saskia is really growing and is so pretty! Easter blessings to your entire family. I really love the courthouse blocks. I can't say whether or not to go back to using only 6 blocks because I just love the blocks and either way they're fantastic. As for the real life scallywag, Saskia, she's too darn fun and cute. Thanks for sharing pictures with us. You are so tempting me on these courthouse square blocks. I like it with those fun colors. However, (there's always a however!) I think the bottom left one is dragging down the quilt. It appears too dark in the quilt. Not enough fun bright color in it. So, I'd replace it. Alternative idea if you don't want to make more is to drop the bottom row and make it 3 x 3. Looking it over again, actually, maybe if you put the darker part of that bottom left block on the bottom it wouldn't scream at me. I love the Courthouse Steps blocks - all twelve of them. Nora Roberts movies have been showing here on Saturday night TV. What a fun day you had, and who says ice cream is not lunch!! You know I love your blocks, my problem is me, I do not like brown so that is what I see first, I like the soft colors but that is just my 2 cents for what it is worth!! Hi Lurline, sounds like fun at your place! Love the Dolly quilt- not sure about the brown spot-jumped out at me (also bottom leftblock). Cute quiltlet though! Have a great Easter Sunday with your family! Happy Easter Lurline..give my regards to Mum. The little ones must be enjoying all the fun of easter, I do miss little ones having an egg hunt.. I have to agree with Cardygilr...you know i like brown, but the two browns seem to stick out too much against the softer colours.. I like the smaller version, in the previous post best, but the large version is pretty too. Sorry, no help am I? I love your courthouse blocks...they are so colorful. I think that you did a lovely job! Personally I think the two darker browns are dominating but the one on the top right seems ok. I love it with 12 blocks. Once you have the blocks together, you can audition the borders and make a decision. I think it does need a border/borders. The other photos are eye candy. I'm not a cat person but this one is gorgeous to look at. 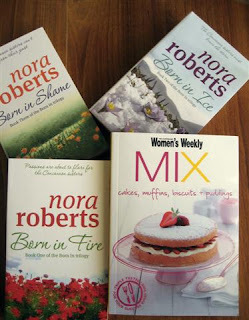 Oh I have read a few Nora Roberts Lurline, but I am into murder mysteries now! I am looking at my furry man here and he is sitting on the chair next to me watching me type... I think he is hungry.... LOL cause thats the only time he wants anything to do with me! yes take out that bold one in the middle and the brown on the bottom left just use less blocks and add a little border if you have too. and a great binding, your done! Did you notice my green basket ,its perfect in there don't you think! thank you again for that piece of fabric I will always think of you when I look at that basket!